Thank you so much to the judges of the March edition of DMBLGIT event, which was hosted by Nika of Nikas Culinaria. 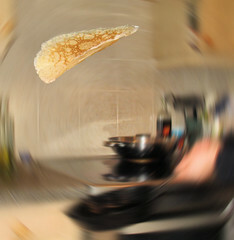 My tossing pancake photo was given the originality award, and I am thrilled! There were 61 entries this time around, all taken by people who love and have an interest in food. Make sure you check out the rest of the winning entries here and if you want to see all the entries, here is the link to the Flickr Gallery. I would also like to thank the judges from Click! 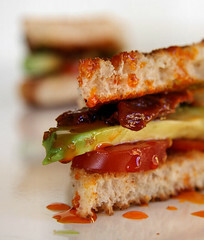 for awarding my sarnie photo second place in February's contest, in which the theme was "RED". The theme for April's Click! is "Spring/Autumn", more details HERE. 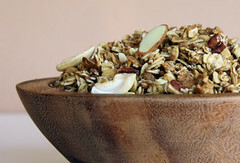 If you live in the UK and want a chance to win the new Kellogg's baked muesli, don't forget to enter the giveaway. Please leave your comment by midnight, Saturday 4th April 2009, to be entered into the random drawing. How on earth did you take that photograph? It is so interesting and full of 'energy'! congratulations it was well deserved, I ove the pancake shot! I remember your photo from the DMBLGIT pool. It's a fantastic shot! Congratulations! Yay! You so deserved that award, Nic! Congratulations and it is well deserved! Congrats dear girl...well done. Both were winners, & so are you! Was thrilled to see the tossing pancake one at Nika's! YAY!! Congrats!! Well deserved, I think!! That was a wonderful photograph Nic. I loved it. Congratulations! Congratulations! And very well deserved too - it's a fantastic photo. Awesome! That is a great photo! Congratulations! Big congratulations, the photos were very deserving of the awards! Congratulations Nic and it is well deserved! Even a blind man would've known yours was thee flippin' photo. You had it coming girl! You have it going on!!! Thank you everyone - you guys are the best!! Congrats on both counts - and that pancake picture totally ROCKS!